Le nouveau spectacle aquatique qui remplacera Legend of Mythica sur les eaux de Mediterranean Harbor s'intitulera Crystal Wishes Journey et débutera le 15 avril 2016. Image conceptuelle : Tokyo Disney Resort. 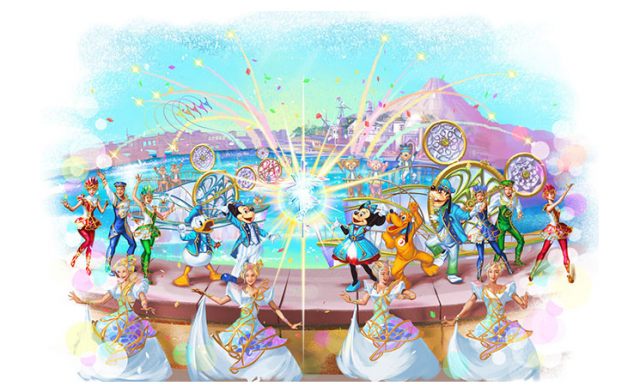 Kicking off the “Tokyo DisneySea 15th Anniversary: The Year of Wishes” event will be “Crystal Wishes Journey,” a brand new show to be presented at Mediterranean Harbor during the special event period only. Appearing before the Guests who anticipate going on adventures that will make their wishes sparkle, the Disney characters, each with their own wish, will appear in this show that celebrates the start of the 15th anniversary journey of adventure guided by shining crystals.